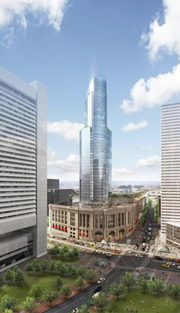 The proposed 51-story tower at South Station has attracted Gemdale Properties of China. Development rights for this project expire in April of 2017. 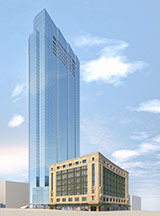 Houston-based Hines said the upper floors of the 51-story tower now include plans for 175 condominiums, with office space below. Thursday night, it won approval from the Boston Redevelopment Authority to bring a new majority investor — an arm of big Chinese builder Gemdale Properties — into the project. “We are delighted to join in this venture with Hines to develop such an important and well-located project in a city which is exhibiting some of the strongest office and residential condominium market fundamentals in the US,” Gemdale said in a prepared statement. 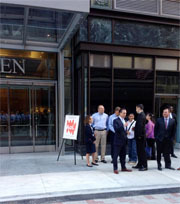 Wells Fargo is on the move in the Financial District with a new lease at Tishman Speyer’s building on 125 High Street. 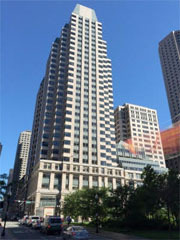 Wells Fargo has leased 150,000 square feet at 125 High St. in the Financial District and will begin relocating 775 employees from three locations in downtown Boston and Back Bay late next year…The 14-year lease for the 11th through 15th floors enables Wells Fargo to consolidate space from three buildings in the downtown and Back Bay beginning in late 2016, spokeswoman Krista Van Tassel said. 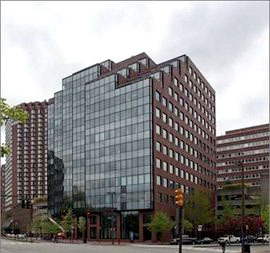 More than 775 employees will move from 1 Boston Place, 101 Federal St. and 200 Berkeley St.
50 Post Office Square is coming to market and could reap $300 million. The building last traded for $192 million ($245.43/SF) on 9/29/08. The new sales number would put this at $383.48/SF. The current ownership has done a remarkable job not only repositioning the asset, but leasing it up as well. Of the 782,304 total square feet there is only 118,500 square feet available on the 5th and 6th floors. 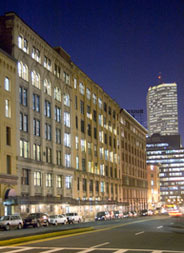 Besides the current investment climate that has Boston among the most popular destinations for institutional and foreign capital, observers claim the move is likely a combination of the natural life cycle of the landlord’s tenure in the property that began in Oct. 2008 when the 600,000-sf structure was acquired for $192 million with partner Commonwealth Ventures. “They figure this is the right time to do it,” says the source who praises Bentall and CV for repositioning an Art Deco building dating to 1948 that was badly in need of an overhaul when the asset previously known as 185 Franklin St. was offered up for sale by Verizon. The newest tenant to downtown crossing has opened, kinda, even though their space isn’t ready yet. Looking for fresh fruit an vegetables, stop by daily from 10 AM to 6 PM! 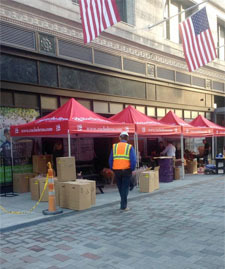 Roche Bros. to set up a farmers’ market outside of its coming Downtown Crossing location to introduce itself to the neighborhood until the store officially opens in early Spring, 2015. You can read the complete statement and related article on the Boston Business Journal’s website. The former Filene’s building in downtown Boston has welcomed it first tenant, AOL. AOL moves into the rejuvenated downtown crossing area of Boston and becomes the new building’s flagship name for now. The Boston Business Journal indicates, “AOL officially became the first tenant to move in to the renovated Burnham Building in Boston’s Downtown Crossing this morning…The New York-based media and tech company moved about 50 employees into sixth floor office space…Next Monday, 600 employees from advertising firm Arnold Worldwide and its sister agency Havas Media will move into about 125,000 square feet of the building, at the corner of Washington and Summer streets. 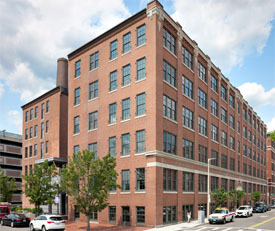 More information on the Burnham Building’s prospective tenants are available on the BBJ’s website. Changes are coming to Copley Place, a 52-story tower to house rental apartments and condos. Currently there is no change to the existing office towers. Additional details are available online, here. What does $630M get you in Boston? 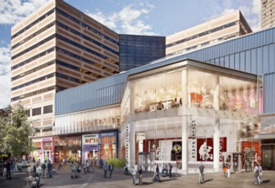 A 1.4 million square foot development in the heart of Downtown Crossing. It will create new residences, office and retail opportunities. Continue on to rebusinessonline.com for more info.